More than once has my wife clipped a recipe; kept track of the clipping for 15 years; finally gotten around to making it; and decided it wasn't any good. Last week's prize goes to Marian Burros' recipe for Spinach Fettuccine with Lentil Sauce from the April 20, 1994 New York Times. I cannot believe that if Marian had cooked that recipe she would have published it. 5 cups of water in the sauce? Why not 50 cups plus a 2 pound box of Madagascar sea salt? After we ate it, and decided it was noth worth making again, let alone the first time, I read the recipe and not for the life of me could I figure out what my wife found so appealing about it. But then I not as adventurous as she is, and don't like munching on chicken feet in a Chinese restaurant, and am no longer willing to even try tripe unless I'm in Italy. And I know for a fact that French cooks, at least the ones Au Pied de Cochon, that Paris 24 hour a day tourist trap, don't make it so I would eat it, but then what I chose wasn't so good either. Adventure for me is doing a tasting of 5 different salumeria's mortadella in Bologna, not choosing between 5 different snake soups in Shanghai. So the other day when she pulled out three cookbooks and opened to the lamb shanks recipes, I got nervous. The first thing I said was, "Do you want to make this, or would you like me to? It's time to post something to the blog." Perhaps that was her purpose in pulling out the cookbooks, but in any case I got to eat what I wanted to make didn't have to endure the shanks cooked with soy sauce and star anise or something creative. 1. 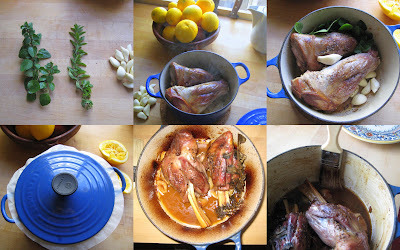 Brown the lamb shanks in the olive oil in a Le Creuset style dutch oven on the stove top without the lid over medium heat. 2. Remove from the stove top, squeeze in the lemon juice, add salt an pepper, the oregano of your choice, and then add the garlic cloves. 3. Cover with a sheet of parchment and then the tight fitting lid. 4. Put the dutch oven in a 350 degree oven for 1 3/4 hours. 5. Add the wine and return to the oven for another 15 minutes. 6. Adda 1/2 cup water to thin the intense liquid, deglaze the sides with a basting brush, and if the shanks were fatty skim off some of the fat. And finally mash the garlic cloves into the sauce. 6. Serve with Bulgar, or orzo. Note: I say Le Creuset, but I only accept Le Creuset as a gift; I buy the cheaper versions from Target, Ikea, or a garage sale. That lentil sauce, as amended, wasn't so bad actually. With a few more improvements and the addition of some sausage it became a delicious soup. Your cooking is good enough to stand on its own; you don't need to slag mine.